Tristomo. 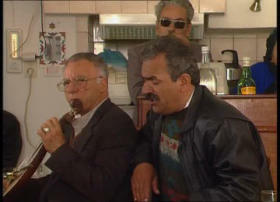 Stay at Anemos hotel for the best experience. 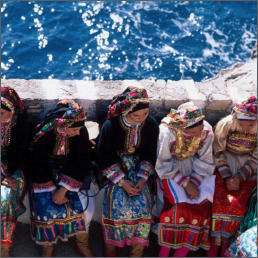 Olympos, a jewel of the Dodecanese, is situated between two mountains. It is a small village on northern Karpathos with over 100 km. of hiking trails, secluded beaches and a unique mix of tradition and nature. This village has been used as a backdrop by famous photographers such as Constantine Manos, Josef Koudelka, Hans Sylvester and many more. Wether you plan on visiting one of the many beaches nearby or enjoying the local musicians that fill the streets of the village with their magical melodies, Olympos is the perfect example of a Greece long lost. 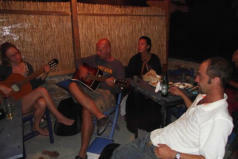 local music and customs, but also has many beaches nearby. 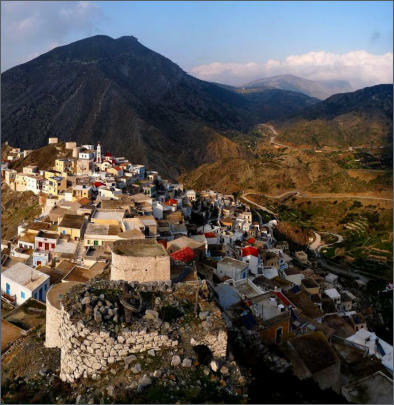 The region of Olympos lies in the north of Mount Kimaras and includes not only this northernmost part of Karpathos, but also the islet of Saria, which is separated from Karpathos by Steno, a straight about 100 meters wide, that was created by soil erosion. 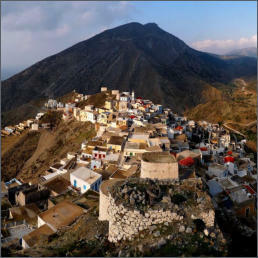 The Olympos region has an area of 37 square kilometers, excluding Saria, which is about a third of the whole island of Karpathos. Most of the region is mountainous and covered with vegetation and woods. The main mountains are Ais Ilias (718m), Orkili (713m), Kimaras (692m), Stioi (639m), Malo (635m), Korifi (588m), Oros (561m), Asia (531m) in Karpathos and Pachi Vouno (630m) in Saria. The most important plains of the region are the valleys of Avlona, Ahordea and Kilios and the valley of Pila in Saria. Smaller in area but still important, as far as agricultural production is concerned, are the regions Pei (the name comes from the ancient word πεδίον=field), Kampi, Ammoi (from the ancient word αμμόγη=sandy soil) and Nappa (valley) and Argos (plain close to the sea) in Saria. One interesting element of the local geography is the partition of the region by the sea, where the impressive natural harbor of Tristomo was formed, and the many picturesque bays such as the Vroukounta, Fises and Evgonimos bays on the west side, and the Vananta, Diafani, Apokapos, Opsi, Kapi, Agnontia, Forokli, Kantri, Filios, Nati bays on the east side and the Giaplos, Palatia, Alimounta and Mea Alo (long beach) bay in Saria. Although the region doesn't offer itself to plant growing, the diligence of the inhabitants, who didn't leave even a square inch of soil uncultivated, made it possible to feed about 1,500 people, the inhabitants of the village in the 40's and 50's and perhaps in earlier years. Vroukounta, and Nisiros "homonymous with the island of Nisiros"
services unselfishly and unimpeachably for more than twenty years. three centuries of the second millennium AD.  Turkish navy under Hairedin Barbarossa overthrew the Frank rule. Turkey under the Provisions of the London Protocol, signed in 1830.
and the region. Today many of the houses in the village are uninhabited because of immigration. Boat trips are an easy and care free way to enjoy the island beaches. Most of the beaches can also be reached by car but the boat gives another dimension to visiting. There are three boats to choose from at the port of Diafani. Nikos boat visits all the beaches including Agios Minas beach which others do not . Make sure to ask about this before buying the ticket. All customers of Anemos hotel that stay for a period of longer than 5 days are entitled to a 50 % discount from their first boat trip to beaches. This does not include the Saria excursion. Boat trips are an easy and care free way to enjoy the island beaches. Most of the beaches can also be reached by car but the boat gives another dimension to visiting. There are three boats to choose from at the port of Diafani. 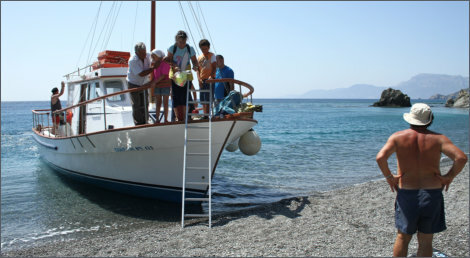 Nikos boat visits all the beaches including Agios Minas beach which others do not . Make sure to ask about this before buying the ticket. All customers of for a period of longer than 5 days are entitled to a 50 % discount from their first boat trip to beaches. This does not include the Saria excursion. 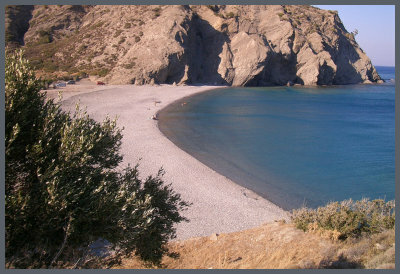 Once in Olympos you can visit many beaches either by car or by boat . There are boats leaving from the port of Diafani (7km) to all the main beaches and other smaller beaches upon request. You can also drive to the majority of the beaches by Jeep. Agios Minas beach is one of the best the island has to offer and there is a restaurant that offers fresh fish cooked on charcoal as well as grilled meats and other Greek delicacies. It is called Anemos Sunrise . There is also a free internet connection, and a shower to wash off. Other beaches worth a visit are Agnontia, Nati, Diafani, Vanada, Forokli and many more ! 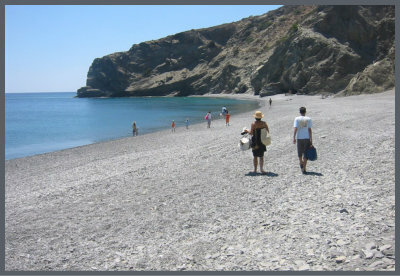 Agios Minas is considered by many as the best beach on the island. You can reach this beach by boat from Diafani and Pigadia or by jeep or atv . There are two roads that can take you there both of which also lead to other beaches. 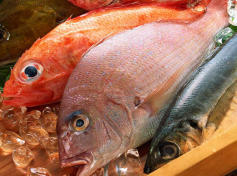 You can visit Nati or Agnontia beach then head towards Agios minas for fresh fish or grilled meats . After your stay you can stop at the church to take pictures of the beach and the panorama. Either on your way to Olympos or after you visit Agios Minas provides you with an unforgettable experience that will bring you back time and time again. Agnontia beach is situated on the east side of the island. 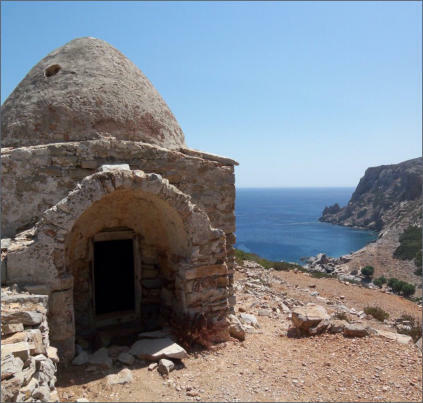 You can get there by using the road to Agios Minas that is closest to Spoa or by boat from Diafani. It is a dirt road appx 4 km distance and well worth the visit. 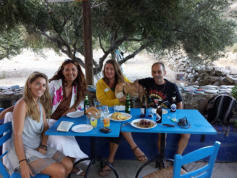 After visiting you can also visit Agios Minas for food and drinks . Nati beach is also situated on the east side of the island. You can get there by taking the road to Agios Minas that is closest to Olympos or by boat from Diafani. It is approximately 4 km and is worth the visit . 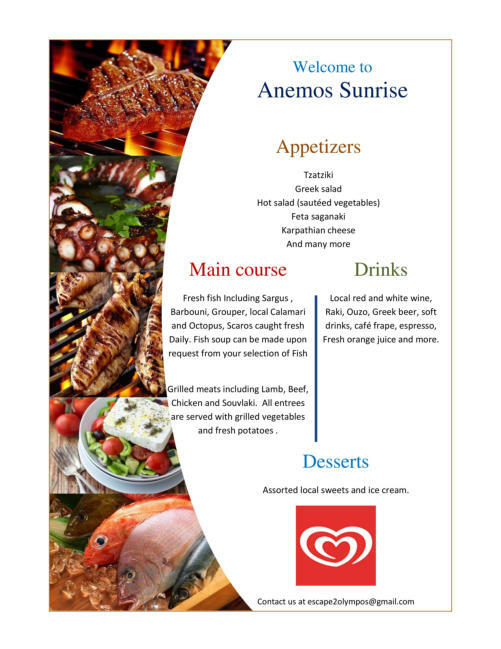 After visiting you can also visit Agios Minas for food and drinks . Forokli beach Forokli beach Is situated on the east side of the island. You can get there by road It is the first intersection after leaving Olympos or the intersection just before arriving to Olympos. 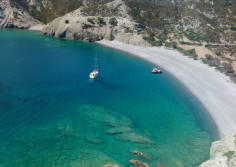 Once in Olympos you can visit many beaches either by car or by boat . 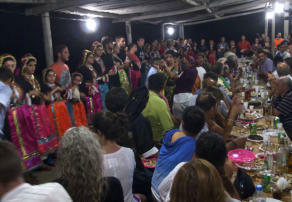 There are boats leaving from the port of Diafani (7km) to all the main beaches and other smaller beaches upon request. You can also drive to the majority of the beaches by Jeep. 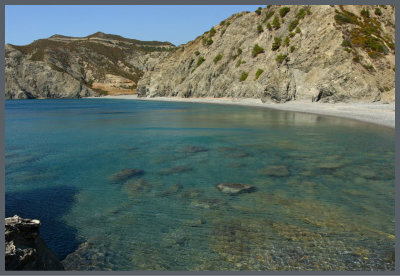 Agios Minas beach is one of the best the island has to offer and there is a restaurant that offers fresh fish cooked on charcoal as well as grilled meats and other Greek delicacies. It is called Anemos Sunrise . There is also a free internet connection, and a shower to wash off. Other beaches worth a visit are Agnontia, Nati , Diafani , Vanada, Forokli and many more ! and the sea. The traditional beds will make your stay here a unique experience. Feel free to contact us for any questions you may have on Olympos. 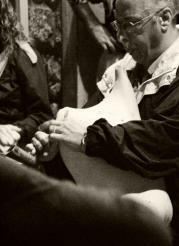 There are many more festivals throughout the year. And much more for you to discover when you visit. Let us help you make your visit to Olympos an unforgettable experience. A group of businesses that cater to tourism. We restore old buildings and convert them for various uses. 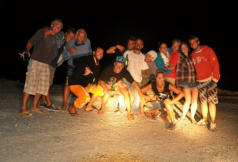 Among those are Taverna Anemos Sunrise at Agios Minas beach and Anemos Hotel in Olympos.